Seventeen contracts were signed last week at $4 million and above, sluggish activity that mirrors the same total in the same week last year. The average days on the market was a dismal 521. Prices on average were reduced by 8% off the original asking price before a property went to contract. The top 2 deals were sold by sponsor/developers. 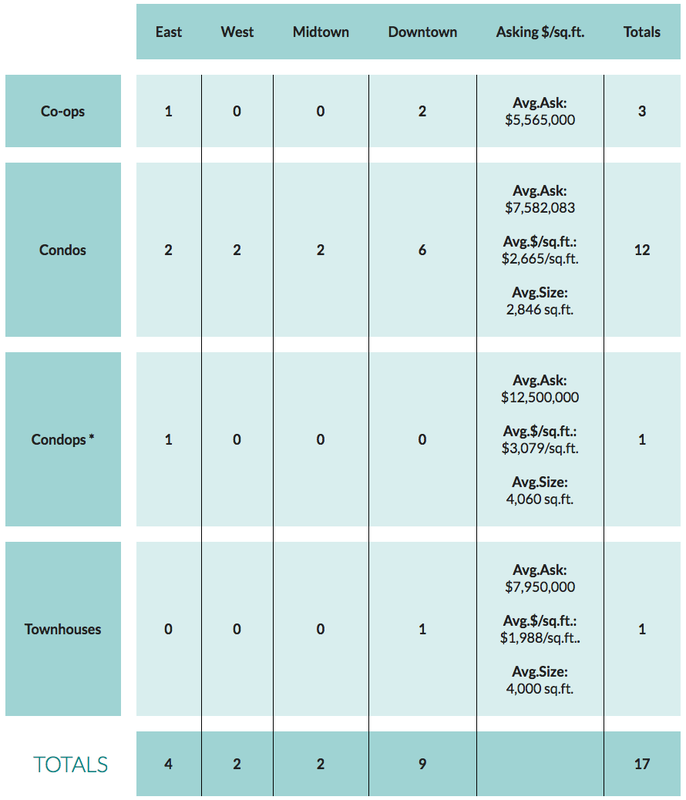 For the seventh time this year, the No.1 contract was at 432 Park Avenue. This time, it was 41C, asking $17.175 million. The condo has 3,575 square feet including 3 bedrooms and 3.5 bathrooms, and features a 29’ x 29’ corner living room. The building is 96 stories high, a concrete-and-glass edifice designed by Rafael Vinoly that can be seen from almost anywhere in the 5 boroughs. Amenities include a fitness center, a 75-foot swimming pool, private dining room, parking, a garden, and a children’s playroom. The No. 2 contract was 5E at 21 East 61st Street asking $12.5 million, reduced from $15 million when it went on the market in May 2014. It has 4,060 square feet and includes 5 bedrooms and 5.5 bathrooms. A living room, formal dining room, and kitchen with a family room---all face Madison Avenue. The apartment is in the Carlton House, a 16-story building that was built as a hotel in 1950, and was converted into a 69-unit condop by Extell Development. (A condop is a co-op that leases the land and has condo rules.) Amenities include concierge, doorman, a fitness center with a swimming pool, and bike and storage facilities. Many of the units have terraces. Older PostUES $75,000/Night Is Nation's Most Expensive Hotel Room.